This post is long overdue. For some time now, many of you have probably noticed that the volume of my blogging on Telerik Watch has started to diminish. In all of 2011, I published only 45 posts, compared to more than 200 in 2007 and 2008. What's going on? Have I lost interest in the topic? Does the change spell trouble? It's actually a number of different things that have lead to reduced blogging on this venue, so let me explain. In the fall of 2006, I was busy working full-time at a Fortune 200 Enterprise IT shop, pecking away at Unix, Perl, and other forms of "enterprise development." While it paid the bills, it did little to capture my attention. Outside of work, I was pounding away on a small SaaS (though at the time we just called it a website) product for managing job fairs. I had started a company with college friends in 2005 to do this, and we were plugging away, evolving the product and business. To build this product, we needed tools. We were bootstrapping, so anything that could save time helped us do more for our customers. That's where my relationship with Telerik began. I became an active and passionate Telerik customer, eventually earning Telerik MVP status. I would spend hours pouring through the Telerik forums helping people use Telerik's tools, and in turn I became deeply familiar with Telerik's product (only one) and operations. At this time (2006), Telerik did a poor job of communicating around a release. In fact, it was not uncommon for a "release date" to come and pass with no update and no release. As a customer, this was confusing to say the least. Plugged-in customers, those using the forums like myself, could get the back story and updated release date estimates, but the broad mass of Telerik customers had no idea what was happening. So I figured I would do the Telerik community a service and carve-out my own niche in the blogging world, much in the same way Paul Thurott was at the time the go-to Microsoft blogger. Born was Telerik Watch, a blog focused on Telerik news (like release dates) and reviewing new Telerik tools. It wasn't more than 5 months after I started Telerik Watch, though, that I became an employee! I put my SaaS project and business on a shelf and decided to join a team of professionals I'd become very passionate about over the previous 2 years. The rest is history. I was the first American employee, first (and only) evangelist, and now paid full-time to do things like Telerik Watch. It's been nothing short of an adventure. And while I didn't plan on 5-years being some kind of transitional milestone, that's the way it has worked. At the beginning of this year, I moved from Chief Evangelist to VP HTML5 Web & Mobile Tools at Telerik. The new role is full of new challenges, and it will represent a shift in my focus at Telerik. Does it mean the end of my blogging, though? Nope. Just some changes. As a result, Telerik Watch is no longer the most appropriate place for many of my posts. I've started to blog most frequently on the Kendo UI blogs, with some occasional blogging on my other site, htmlui.com. My plan is to blog most frequently on those two sites, still using Telerik Watch for occasional Telerik and Microsoft specific posts (like my very popular BUILD posts last year). In that sense, Telerik Watch is not dead, just less active, only used for my significant thoughts on Telerik, Microsoft, and .NET. My hope is to eventually unify all of my various blogging efforts in to single, filterable stream you can subscribe to. Something like "toddanglin.com/blogs," from which you can find my HTML5 blogging, Telerik blogging, and maybe even more general topic blogging. But that's a pipe dream for now, "spare" time being what it is. So that's it. The full (abridged) story. Of course, adding more daily exercise to my routine, having a baby, and being responsible for more people at Telerik all play a role in reducing my blogging time, but I want you to know I'm not gone or abandoning Telerik Watch. I hope you'll keep your RSS readers connected and keep-up with my updates in the future. Who knows, my focus may one day shift back and Telerik Watch may once again see more than 200 posts in a year! Until then, standby for my next great thought on the world of Microsoft and Telerik, and join me for frequent postings on KendoUI. I know it seems like I just blogged about the Q3 2011 Webinar Week, and in some ways you're right. The Q1 2012 release is coming a bit earlier this year, so that means it is time for another week of info-packed webinars and prizes. Following the success of the Q3 2011 format change, we will once again be hosting multiple events each day during the Webinar Week. This helps us get as much information as we can distributed to you so you can jump-in to the release bits. The week of web events will kick-off on Monday, February 20th. That's a lot of content! As usual, you can easily sign-up for one or all of these events using the Telerik simplified webinar registration form. Just check the boxes next to the events you want to attend, fill-out the simple form, and sign-up. For most events, we will raffle one Telerik Ultimate Collection ($1999 value) to the live attendees. The more events you attend, the more chances you have to win. Bribery? Sure. In the name of having fun with another loaded Telerik release. The Sitefinity, TeamPulse, and Test Studio events will separately raffle licenses for those products. Same rules apply, though. Must be present to win. That's about it. Register today! We're only two week away from the Webinar Week, so register now before you forget. Q3 2011 Webinar Week, This Week! The Telerik Q3 2011 Webinar Week begins today! To register for any (and all) of the webinars, just visit Telerik.com and use the super-simplified registration form. One form submission is all it takes to register for the entire week (if you have the time). Since the schedule is kind of complex, and since a few of these events need some more explanation, you should plan on joining me, this morning (Monday) at 9:30 AM Eastern. I'll cover the entire schedule and explain in more detail how the week is going to work. Each webinar will also raffle away one Telerik Ultimate Collection ($2000 value)! The more webinars you attend live, the more chances you have to win. We'll email winners within 24hrs of the event and post the winners to Twitter (@telerik). That's pretty much it. Of course, all of this is happening because of the Telerik Q3 2011 release two weeks ago (which I assume you've downloaded by now! ), and I'm very sorry I haven't blogged more about that yet on TelerikWatch. Make sure you catch all of the release coverage on the Telerik.com Blogs. For now, we've got a full week of live web events for you to enjoy. It's not too late to register or to attend more webinars for more chances at prizes. I hope to see you online this week! 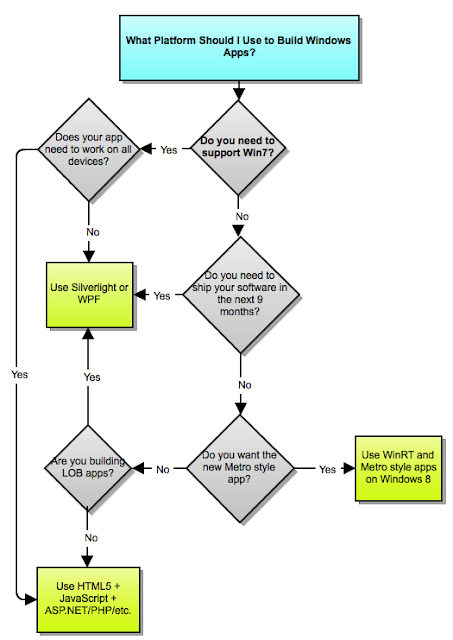 During my busy week at the Microsoft BUILD conference, I cranked-out a quick and rough decision tree designed to help you decide which Microsoft platform you should use for app development: Silverlight/WPF, HTML5, or the new Metro/WinRT. The chart proved to be very popular, so I thought I'd revisit the decision tree and with the benefit of more time to reflect, produce a new, more complete version. Thus, I present version 2 of the "How to Pick Your Platform" chart. In the original chart, the first question I made you answer was, "Do you need to support Windows 7?" It's a fair place to start given that everything new introduced at BUILD is Windows 8 only. There is no path for Metro back to Windows 7 (or Vista and XP, for that matter). But in today's world, Windows is not the only relevant OS in town. We've been trained through years of Windows dominance to think building for Windows is building for the biggest audience, but we need to update our thinking. Yes, Windows remains the dominant desktop OS. The problem is that many people are now doing more "computing" on non-desktop devices, like iPhones, iPads, Android devices, and (for now) Blackberry. In this realm, Microsoft (and Windows) is just one OS choice among the pack. So the first question shouldn't be about which version of Windows you want to support, it should be about your desire to build software that targets the broad marketplace of devices and operating systems. In the first version of the chart, I oversimplified the choice of Silverlight/WPF if you decided to build Windows apps that support all versions of Windows. I've expanded that decision tree in version 2. As part of that expansion, I also reintroduced WinForms as valid platform choice (because it is). I was reminded during the BUILD week after visiting with a customer that WinForms is still hugely active as a Windows development platform. Of course, I knew that from Telerik's own experience with growing WinForms popularity, but it doesn't get talked about often enough. We've all be talking XAML for the last 3 or 4 years, but WinForms has continued to get work done. It was good enough to solve business problems in 2001. It still remains good enough to solve many business problems in 2011. So while Microsoft is spending time with Windows 8 trying to win the minds of consumers, the business app story marches on with Silverlight, WPF, and WinForms. Pick between these platforms the way you always have and the apps will work Windows 8 through Windows XP. The only new "edge" for Silverlight is that your skills building those apps will more quickly translate to Metro if you decide to build Metro apps in the future. Metro in Windows 8 is not appropriate for every app. Clearly, missing from Doug's classification are any business app scenarios. This is intentional. Business apps still belong in desktop Windows, even with Windows 8. And if you start building for the desktop, the platform decision is back to Silverlight, WPF, and WinForms. You can theoretically use any of these options for building any Metro app, but realistically, some are better suited for certain tasks than others. Most obvious, native code and DirectX. I guess you could build a Twitter app with Native Code, but why would you? You'll waste way more time coding than you'll gain in performance, so probably not the best choice. Instead, this raw, on the metal option is generally best reserved for rich, immersive games. After that, it becomes more a matter of choice. Choice is good to a point. Too much choice is paralyzing. With the introduction of three new ways to build apps for Windows, you may feel like you're trying to pick between a billion new and "old" ways to build for Windows. Don't panic. Just use my simple chart, and your decision is easy. And no matter which decision you make, Telerik will continue to make you a .NET Ninja Rockstar with industry leading tools and support. While Windows 8 is ushering in an exciting new model for Windows development called "Metro style apps" that run a new "unified" Windows Runtime (WinRT), it's not necessarily the right choice for all new Windows software development. In fact, there are a lot scenarios where it's not a good choice. In this over-simplified decision tree, I try to provide some crude logic for how to pick between your platform options. Clearly, there are many nuances not covered in this tree, but I'll work on expanding the "logic" to make it more bullet proof in the coming weeks. The first decision is the most important, though: Do you need to continue building apps that work in Windows 7? If your answer to this question is "Yes," Metro style apps and WinRT should not be on your radar. These are Windows 8 only technologies, and there will be no backport layer that will let you run Metro apps on Windows 7. IF, however, you want to put apps on the Windows Tablets that will start shipping late next year, and IF you accept that these apps will only run in that Windows 8 Metro environment, then you should start digging-in to and learning WinRT.